If leaders in the Chicago region want to reduce crashes and save lives, new data shows more resources should go towards redesigning arterial streets. According to the Active Transportation Alliance’s 2018 Chicago Regional Crash Report, 53 percent of all crashes in the region occur on arterial roads, which make up 36 percent of the lane miles in our region. These roads often divide communities and serve as barriers for people biking and walking to jobs, parks, healthcare centers and other popular destinations. Active Trans compiles and analyzes public data annually on trends on bicycle and pedestrian crashes, injuries and fatalities. Every year the Illinois Department of Transportation (IDOT) reviews crash data reported from local municipalities to ensure accuracy before publicly releasing it, typically with about a 12-month lag. For our most recent Regional Crash Report, we used 2016 crash data, which IDOT released in May 2018. The state’s 2016 data shows a slight increase regionally in motorist fatalities and injuries, and slight decreases in pedestrian and bicycle fatalities and injuries. 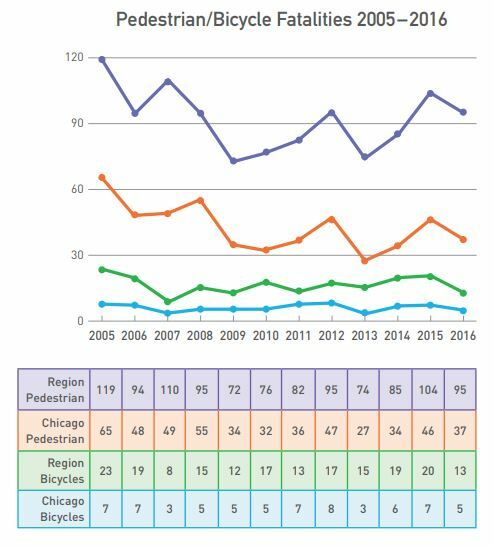 Unfortunately, preliminary 2017 data compiled by the Chicago Department of Transportation (CDOT) suggest a recent uptick in pedestrian and motorist fatalities, consistent with national trends. The most common factors in serious and fatal crashes are speeding and failure to give the right of way. People on foot and bike are most vulnerable to serious injuries and are more likely to be involved in hit and run crashes when the driver flees the scene. The state recently began reporting hit and run crash data and in 2016 25 percent of all pedestrian and bicycle crashes were hit and runs. Redesigning arterial streets and investing in infrastructure to better protect people biking and walking requires dedicated funding. For decades Illinois has spent far too much money on transportation “improvements” designed to move more cars at faster speeds through densely populated corridors. These investments have made our roads less safe for all users. Active Trans fights every day to get more Illinois elected officials, agency leaders and residents to rethink this car-centric approach and invest more in biking and walking infrastructure. Join the fight for safer streets statewide by signing up as an advocacy supporter in your community.